They are in used condition. Here is my grading system. Bad = 1 skip or more and or warped. Poor = A lot of surface scratches but no skips. Good = Some light surface scratches but plays good and no skips. Great = Overall good looking and plays good with no skips. This listing is NOT for all of them. If you are interested in purchasing all of them send me a message so we can negotiate a price. I made this listing so I would not have to list each record individually. If you are interested in a record that is listed Message me so we can discuss a price. I understand some people like to collect freestyle records for casual play and others use them to DJ. I try and base all my prices on condition and rarity. This list is still available. Virginia – is it me or is it here. Dtu – look into my eyes. Joey kidd – greatest hits. Tiana – tell me why. Judy torres – love you, will you love me. Nv – forget me. Soniya – give into me. Wendy – i know sealed. La mour – you told me / baby baby. Legacy – girls do it just for fun. Lil johanna – take me in your arms again. Johnny o -runaway love. & more – you’ll never find another love. Atilla – i want to love. Rei summers – do you remember. Quadlibet – take me i’m yours. Third degree – love at first sight. Tiana – come to me. Gino caporale – destiny. April – right on time. Tka – you are the one. Trinere – when i hear music. Tka – one way love. Pajama party – yo no se. Johnny o – don’t go away/I just wanna get to know you. Johnny o – i know that you love me. Expose – greatest hits. Sweet sensation – greatest hits. Johnny o – fantasy girl 2. Laissez faire – after the lovin. D’zyre – games of love. Judy torres – no reason to cry 2. Natalie – i want your love/ I use to. Body & style – listen to my cries. Da a clan – one way love 94. Law – one more chance. Michael vasquez – memories of love. Dove – alone in love. Rochelle – praying for an angel. Feneli – open your heart. Of unknown origin – naomi. Jossette – where are you know. The nasty boys – intimate strangers. Law – missing your love. Jeannette – don’t ever go away. Romeo – one more day. Face – happy days. D’zyre – forever amor. Tolga – just another night. Babie & keyes – secrets of love. Tury q – hands of time. Liasion – heart & soul. Poze – it’s not over. Vocal image – why. Bobby delante – deja vu sealed. Judy torres – holding on. Michelle – reach for the top/ lover boy. Tara – waiting for your love. Vision – night after night. Tee – come into my arms. Tolga – sending all my love. Nina bena – sweetheart (Very Special Remixes). Tlr – one more try. Nv – crystal waters. Angelina – without your love. Corina – out of control. Julie meyers – i want you. George anthony – i love you. Judy torres – i love you for all seasons. Coro – where ae you tonight. No mercy – please don’t go. Heidi mathus – tables turn. Safire – made up my mind. Pain – im the one to blame. Legacy – the time is right. George lamond – bad of the heart. Safire – boy I’ve been told. Corina – give me back my heart. Coro – can’t let you go. Stevie b – girl i’m searching. Stevie b – i wanna be the one. April you’re the one for me. Gina lanze – i will carry on. Wickett – i want you/ second chance. Johnny mans – the day you left me. Loud & clear – fire in your eyes. Carlo – i can’t resist. Naif – I can’t stop the love. Rio deige – tears. Laissez faire – in paradise. Joel – prisoner of love. Alexia philips – all broken hearted. Self image – one true love affair. Pain – i’m the one to blame. Dmx – what happened to forever. Africa bambata & the soul sonic force – planet rock. Stefani bennett – don’t let me go. Lil suzy – take me in your arms. Jasmine – on the loose. Judy torres – come into my arms. Kimberly – misjudged love. Make believe – when i hold you. George lamond – without you. Cheree – got me loving you. Anthony michaels – cries in the dark. Cynthia – what will it take. Chris phillips – i need you. Luis damon – should’ve never let you go. Charlie – promise not to leave me. Edee – baby it’s you. Backside wickett – don’t let me go. Nv – girl you hear me crying. Audriana – i won’t be satisfied. Lil suzy – promise me. Thumpin freestyle quick mixx – 20 songs. Stevie b – spring love. Judy torres – please stay tonight. Wendy – i want you back. Roger – now is the time. Johnny o – we can’t go on this way. Ffwd – baby don’t go / baby no te vayas. Lorenzo d’lan – if you were mine. Michael anthony – if this is love 4. Laura enea – can we find a way 2. Simon sez – loverboy 3. Katja – i want to know – sealed. Bobby delante – deja vu – sealed. Sonic – be together. Sammy c – a distant memory. Angelique – i can’t live without you. Lil suzy – falling in love. Teaz ii pleaz – i was the one. Tpe – then came you. Joe zangie – you & I. Joe zangie – in my dreams. Marano phillips – i’ll be waiting for you/ how could you love me. Soraya – i never loved you. Sammy c – other part of me. Bobby delante – moment in time. Tka – louder than love (greates hits). Clear touch – fallen angel. Lauraine – think twice. Lil suzy – I just can’t get over you. Ania – alone again. Dominica – love strings. Charlie rock – missing your love. Michael christopher – baby i love you so. Passion play – baby can’t you see. Tonasia – games of love. Willie valentin – no matter what. Marisol – begining of the end. Lia marquis – take the time. Soave – if you want me. Sequel – it’s not too late. Samantha – be sure. Abby lynn – no more tears. Annette – i still love you. Law – remember the times. Sergio – in and out of love. Exo – why did you do it. Donna williams – alabyes. Donna williams – true love never dies. Collage – i’ll be loving you. Denine – tearshed 93. Collage – diana/ i’ll be loving you (spanish version). Michelle lee – it was you. Latin soul – promise me white label Rare. Sammy c – faded destiny. W&e – the pain of love. Nv – just like the wind. Peter fontaine – you are an angel. Peter fontaine – one moment in time. David – i’m not going to cry over you. Bobby delante – mirage. Tka – scars of love. Joey gold – devil in my heart. Natalie – i want your love. Deniz – you were the one. Nicole daniels – forever. Julie – One Last Kiss. Lil Johanna – Real Love. Samantha White – Time. Spanish Fly – Treasure Of My Heart. La Mour – Torn Between Two Lovers. Lil Suzy – Real Love / Till The End Of Time test press. VLA – I Gave My Heart / We Won’t Let Each. In – Effect – Here I Go Again. 8th Angel-Guilty Of A Crime. Wendy – I Know. Leticia – why do you treat me badly. Nu-image tears in my eyes white label. Nv – some kind of love. Reinaldo – another night. Osu – only time will tell. Wickett rich – why can’t you be mine. Tlr – unforgiven love. Pure pleasure – when will you come back 2 me. Nu image – sounds of love. Pure pleasure- bring me back. Pure pleazure-in and out of love. Pure pleazure – I need you now. Dtu- my broken heart 94. Angela Garcia – sounds of heartbreak. Buffy – no one. Onnie- would you know love. Trinity 3 – tears are falling. Pain- I feel it in my heart. The item “Latin Freestyle 12 Record Vinyl mp3 Classic” is in sale since Wednesday, May 25, 2016. This item is in the category “Music\Records”. 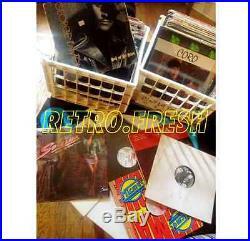 The seller is “retro.fresh” and is located in Chicago, Illinois. This item can be shipped to United States.